Just a reminder of where we were going on the back of CK's rig. 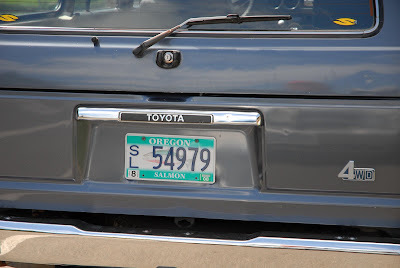 Its been a while since my last post but I think its been worth it to come back with a little trip to the Oregon Salmon! Ryan and Chris do a great job covering the run. 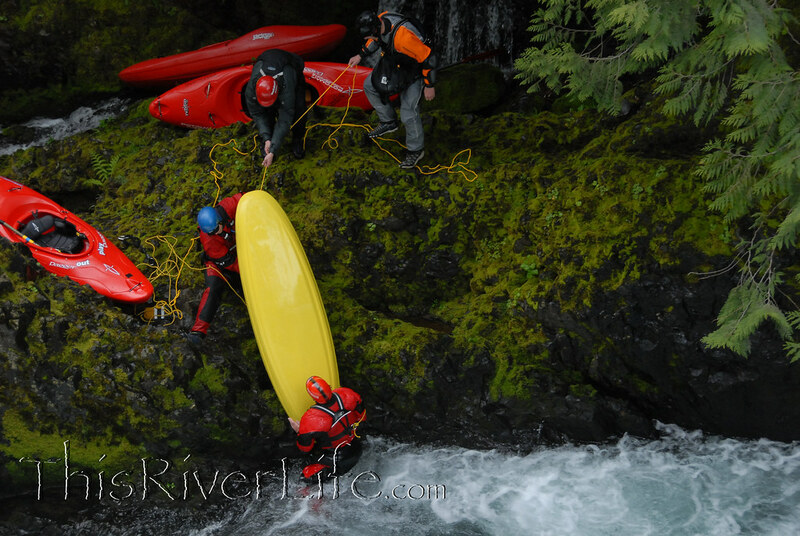 Check out their blogs for some super shots but for me the weekend started Saturday when the Chrises and I left Corvallis for Hood River, on a mission to pick up CK's new boat, Valerie, meet Jeff and hammer out a quick Truss run on the way. A late start meant Jeff ran the Truss solo but we pushed on down to the Salmon and did a quick hike scout up from the bottom. After a night of interviews by the Associated Press (I have no idea how CK pulls this stuff but its always an adventure with the guy) we hiked in and made our way down to the river. It start right off the bat with a sweet 15ish footer with a kind of interesting log duck lead it... nice. My preferred line at Final Falls. Jay G after throwing the rest of our boats for us. 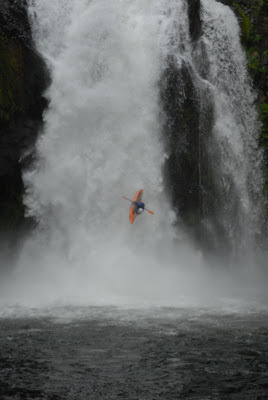 Chris K hucking his paddle at the last second on Final Falls. Oh and Keel breaking into our take out cars... that was clutch. On other notes, I've finally started the 9-5 lifestyle, but that's ok for now. Life has been intense lately and a little daily grind is ok for now. Especially when I can still get into awesome gorges with awesome people. BUT Summertime means Spencer's hole is just around the corner too so I'm looking forward to getting back in the playboat soon. Its been too long. Also, I've happily been noticed by Playak.com, a great site that I use all the time. I feel like I've hit the big time! For the 8th time, paddlers from all around gathered at Alberton Gorge and the Triple Birdges put in for the Best in the West Rodeo. 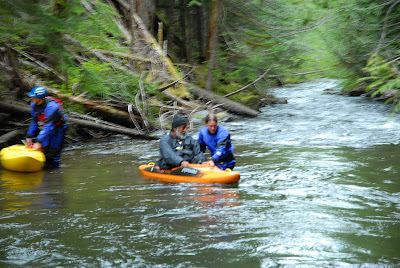 Hosted by Seth Warren, who did a great job despite the highest early season water level anyone could remeber. 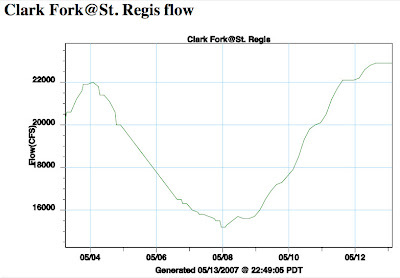 On the 12th of May the Clark Fork was heading up and showing no signs of stopping. 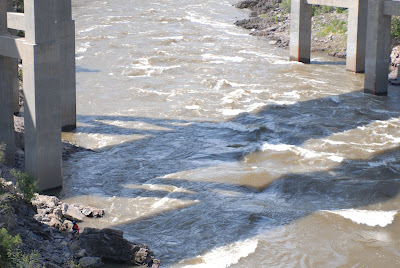 The high water more or less washed out the whole stretch making a standard format rodeo impossible. Billy watching as what should be Comp hole, greens out. Seth Warren did a great job organizing a competition despite the flows settling a down river team and individual freestyle event judged at three locations along the way. Triple Bridges, Tumbleweed and Fang. Judges paddles down to set up while the the competitors did their best to stay excited. The whole run only took about 30 minutes at the high levels though the boils were pretty exciting. 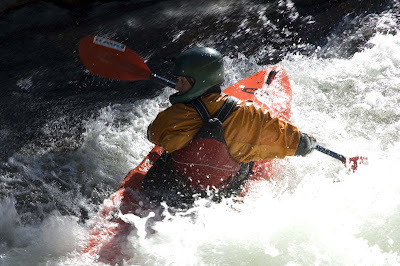 I heard about one paddler who dissapeared completely during the competition! I opted not to compete because I couldn't find a team (I always was picked last) and because I was hoping for some photo ops BUT becuase the run was so fast, most of the competion had already happend but the time I even put on. Thats ok though, I still got a few. Check em out here. Paddlers at the put in. Specators on the bridge. In the end, Amy Jimmerson and Evan Garcia came away individual champions leading their teams as well. A post-party, grubfest, and raffle was held and even I won something. First and probably last time that'll ever happen probably. 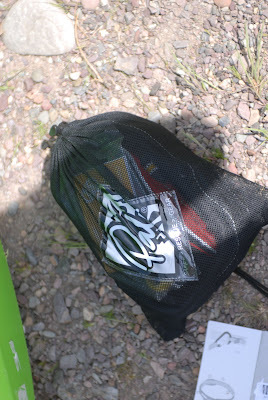 Infact, I won a shirt AND a Palm Tow line! Big thanks for Scott Doherty of Word Class Kayak Academy for putting that together and running the show. Busy guy that day, the WCKA graduation was only a couple of hours after the rodeo ended. I'll definately try and make it back for next year, Scott and Shreder will be taking control and it should be an even better time. Hopefully water levels will be closer to normal, Brennans might even be an option! It was really great meeting so many great folks and paddler, getting to know some of the WCKA kids better, even meeting their families. I've got lots of respect for Scott and Seth for working so hard to make the whole thing happen. 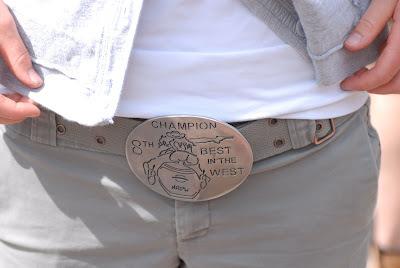 Personally, I just can't wait to see next years buckle! 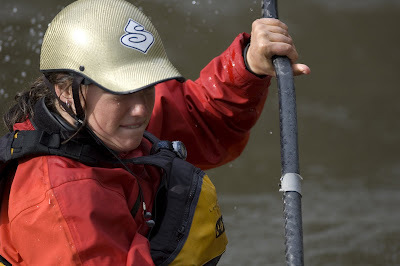 Did you ever have one of those days at you playspot where you felt like things were really coming together, like you were getting to be a 'pretty good' playboater only to have some kid come down and throw some sick moves you didn't even think were possible in that feature. 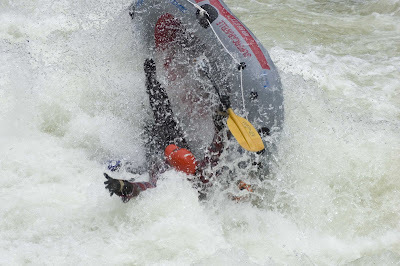 Its been happening to me alot lately; seems like everywhere I go I run into the World Class Kayak Academy kids. 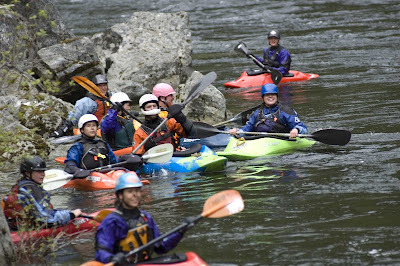 The instructors were up on the Little White Salmon not so long ago, the the Lochsa, now back in their home of Missoula, on Brennans Wave and out at Triple Bridges. Given the oportunity I decided to try get some photos. Check em out! 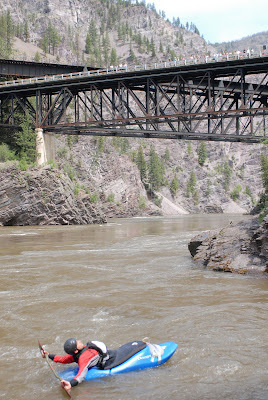 After a great weeked on the Lochsa, and a couple of days on the wave in Missoula, I met up with Ben again for Bear Cr. I had tried to get on this one last year but it was already too low. That day is the subject of a long story involving getting skunked three times in one day, in two states, wrecking a tire and driving back to Missola from Coeur d'Alene on a donut spare at midnight. Good times! Well this trip was quite a bit better. The level was just lapping at the top of the guage rock, almost, so as Ben said, "This is a non-nervous level." 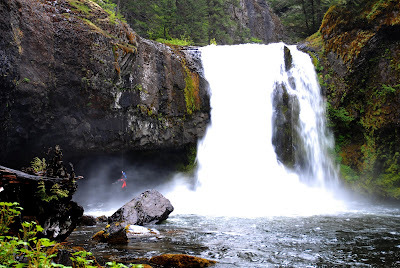 A couple of days before Ben had mentioned to me that Jessie, a local paddler had scouted a waterfall about 1/2 mile upstream from the normal put in so we all decided to hike on up and have a look. 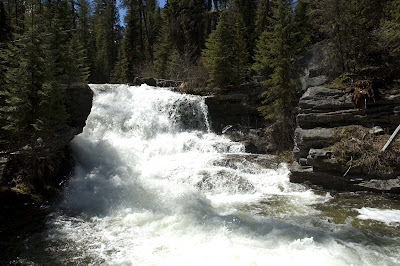 Waterfall on Upper Bear Cr. 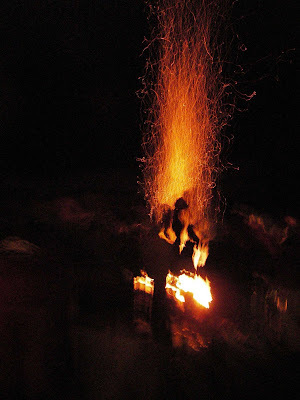 Taken from the log jam. After looking at this steep multi-tierd slide with a scary logjam in the runout we all back down. Ben didn't like the logjam, I didn't like the spinal compression or ankle break potential. All agreed a bit more water and the move around the logjam would be do-able and the injury potential would drop. "AJ would do it," was repeated a few times. 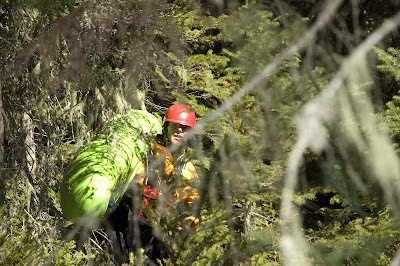 After portaging the as-yet unrun, un-named slide falls we came to another log jam, and another and another till we realized why this stretch was little known and unrun. 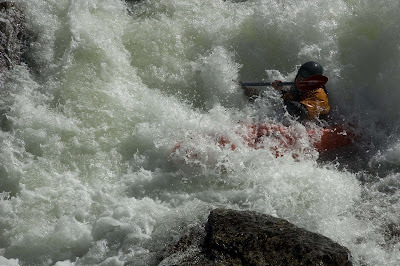 Ben, showing me what Montana Creeking is all about. After getting to the normal put it, the rest of the run was a blur of slides, boofs and holes. Hotel California, Tijuana Crack Whore, and Brave Bear falls were all really fun drops at this level. Just enough to get the dander up, not too scary. I'm not used to boating on slides so it was especially interesting for me but all's well that ends well and after a knocking out the rest of the run we dragged our boats back down to the parking lot for some elk sausage and cheese. Montana Creeking Tailgate! Jessie getting in trying the Tijuana Crack Whore backwards. It also seems that somewhere in there I lost my helmet. If anyone sees or hears about a Sweet Strutter out at Bear Cr, gimme a yell! I went up there a few days later looking for it but didn't find it. I did find the Cr much higher than the other day, at least 5 inches over the guage rock so I think that means Jesse owes Ben some beer. Better luck next time. Cinco de Mayo on the Lochsa! Enough of a draw to even get me to Idaho from Western Oregon, with a few stops on the way. no exception and among those I had met before and those I met there, I am happy to call all of them friends. I was even lucky enough to witness the latest in Whitewater Performance Craft: The SuperCaravelle (sans optional Canopy and Floor Boards) on its maiden voyage from the Fish Creek put-in to Pipeline. Missoula paddlers Ben and Ira piloted this surprisingly worthy craft with only 5 swims between them despite backing down into Lochsa Falls and Pipeline. See some more photos of the day here! Of course the day on the river was followed up by a huge party at the Lochsa Lodge, lots of stories were made and probably forgotten, a few thousand in cheap beer was drunk, along with at least one bottle of JD in the back of a trailer. I am sure you can imagine the rest. 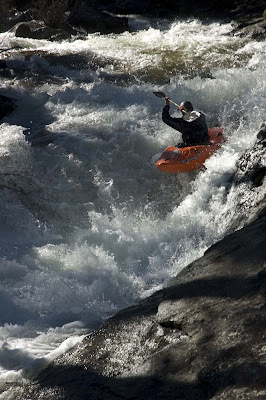 A big thanks to the Missoula paddlers, those who I know and those I just met for letting me tag along, for showing me down Fish Creek and the Lochsa. I had a great time and can't wait to do it again!